Every hamster owner wants their hamster to like them. But hamsters tend to be a little bit more standoffish than your average pet. This makes forming a relationship more difficult, but I’ve done some research and found a method that’ll make it easier. Holding Your Hamster: introducing them to a play tub and trying to entice them into your hand with yummy treats. Establishing Trust: gaining their trust by showing them a game that you can enjoy for years to come. Reaffirming Your Progress: practicing all the things you learn from the first two parts. Having Fun with Your Hamster: enjoying the relationship the taming lessons have created with a playing session inside a giant playpen! The taming lessons are a little more elaborate than the snippets I provided above. But if you read on, you’ll see how each lesson can help create an incredible relationship between you and your hamster! Not every hamster is the same. They all have different personalities, so some of them might never be friendly. Which is why if your hamster doesn’t cooperate, it’s best you don’t force the issue. The place where you bought your hamster might affect the results as well. 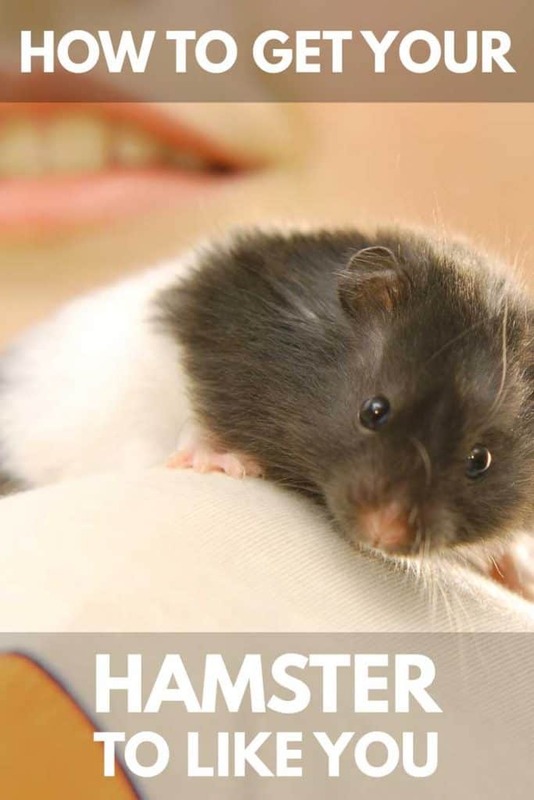 A hamster from an ethical breeder will have a lot of experience with socialization and be more open to being tamed. 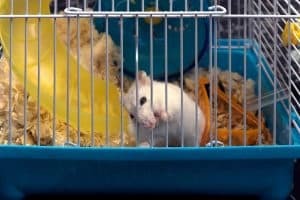 Hamsters from pet stores, backyard breeders, or Craigslist will typically be a lot more standoffish and fight the process. These factors don’t mean these steps won’t be effective. It’s just a general heads up that some hamsters won’t take kindly to the training. And we want these little fur balls to be as comfortable as possible in their homes! If you’re confident your hamster’s used to your scent, you can jump down to the “Taming Lesson” section. But for you newbies, the things you do in the first couple of days can have a vast impact on your relationship with your hamster. When first bringing them home, resist the urge to try and play with them. Hamsters are timid and fickle creatures that’ll need to get familiar with their new homes. If you come on too strong, you’ll end up scaring them and hurt the chances a relationship will ever form. For the first few days, leave the hamster alone in its cage. The new environment will cause them enough stress; they don’t need you messing with them during this transition period. Around the fourth or fifth day, try introducing a tissue with your scent on it. This will sound weird, but put a tissue inside your sock for a few hours; it will effectively get your scent onto the tissue. Then, place it inside the cage and get your hamster comfortable with your smell. Sounds gross, but it will help your hamster get used your presence in their lives. 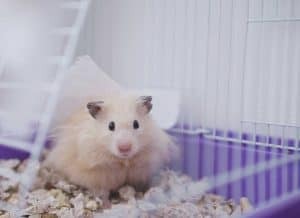 Continue giving your hamster a new tissue with your scent on it every day: the more exposure to your scent through indirect contact, the better. It will reduce the risk of your hamster biting you when the taming lessons start. During the time you’re introducing the scented tissues, try hand-feeding your hamster treats. I’d recommend giving them some vegetables such as carrots, broccoli, cauliflower, or even squash. Once you have them eating out your hand, it’s time to move onto the taming lessons. This entire process typically takes up to five days; however, it can either be longer or shorter depending on your hamster personality. 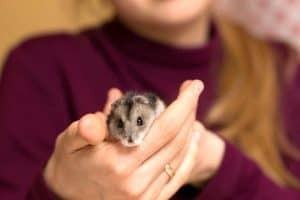 Be sure to keep these lessons at a pace that your hamster is comfortable with rather than forcing the issue. You must also refrain from getting too stressed out by the process; your hamster will feel your anxiousness and become anxious themselves. The materials you’ll need for the following steps are a hamster ball, a small cup, a play tub, and a playpen. Once you have all these supplies at your disposal, you can start building a bonding relationship with your hamster! The goal of day 1 is rather simple: get your hamster comfortable with the idea of you holding them and hopefully crawling all over your hands! Place the hamster ball next to the cage’s door and let your hamster find their way inside. Don’t force them into the ball. Let them do it on their own, which might take a little bit of time. Place the ball inside the play tub and let your hamster explore the new surroundings. Your hamster may seem a little puzzled at first, but they’ll eventually get used to the play tub. It’s time your bribe your hamster with some yummy treats. Open both your hands up together with a little piece carrot or another vegetable in your palm. Lay your hands on the bottom of the play tub. Your hamster will likely be standoffish at first. But soon they won’t be able to resist the yummy treat. They’ll adventure on into your hands and start eating within your palm. Remaining calm during this portion of the lesson is key to establishing a bond. If you’re anxious that’ll your hamster might bite you, they’ll become anxious too. After they’re finished eating, your hamster should start running around with your hand. This amount of progress is enough for the first day and is an excellent place to stop. Put the hamster ball back into the tub and let your hamster climb themselves into it. Return your hamster back to their cage using the hamster ball. Hold the hamster ball up to the cage’s door and when they’re inside give them a treat. Day 2 is all about building a certain level of trust between you and your hamster. For the following steps, you’ll need the small cup I referenced above. If you don’t have a small cup, I recommend using a detergent lid as I’ve found these to be an excellent alternative. Repeat all the steps you did during day 1. It’ll help bring a little routine to the lessons and establish a sense of comfortability. Introduce the small cup as another place to explore. Try to entice your hamster into the cup. Once your hamster’s inside, gently lift the cup a little bit off the ground. With the other hand, form a bridge your hamster can use to jump off and reach the bottom of the tub. After a few successful turns, your hamster will start climbing into the cup just to jump off your hand. It will soon become a game between you and your hamster. The development of this game is a sign that trust has begun developing! Continue the game until your hamster becomes tired and hungry. Use the hamster ball and return them to their cage. Give them a treat to reward their progress and let them relax until the next lesson. There are no new steps to go through during days 3 and 4. Instead, practice the routines your hamster learned during day 1 and day 2. This will help ensure that your hamster’s ready to move onto the last day in our taming lessons. The last step is easily the best one. You’ll finally get to truly play with your hamster inside a playpen big enough for both of you! Step up the playpen and have it ready for your hamster’s arrival. Make sure there’s nowhere your hamster could squeeze through and escape. Bring your hamster over to the playpen inside their hamster ball. Sit down inside the playpen in a crossed legged position. Make a large bridge with both your hands as you did during the small cup exercise. Your hamster might not come out of their ball at first. Be patient and let them come out at their own speed. When they do come out, let your hamster explore and do whatever it wants to do. Your hamster will start crawling all over you, and the friendly relationship you’d envisioned has finally been created. Once you’re both satisfied with the experience, return them to their cage using their hamster ball. Give them a yummy treat and proceed to use the playpen whenever you see fit! I realize a lot of you are wondering how in the world do I set up a playpen big enough for both my hamster and me? Well, it’s actually not that difficult. In fact, here’s an incredible Youtube video that demonstrates a very creative way of creating your own playpen. But I do recommend putting down some newspaper inside the playpen just in case your hamster needs to relieve themselves. The video weirdly left this part of the process out. It could awfully messy without it. With this video and the lessons above, I’m quite confident you and hamster will be on your way to building an incredible relationship. But remember, if your hamster isn’t receptive to the lessons, don’t try and force them. It might not be in their personality to be friendly with their owners, which is entirely okay. If this is the case for you, try and be there for them in whatever way makes them feel comfortable. Previous PostShould You Cover Your Hamster’s Cage at Night?